The hill station Mussooorie is located at a height of 6000 ft is the entry point to the great Himalaya. This place was first discovered by Captain Young in the year 1825 who along with Mr Shore built a resort here. This hill station like its competitors Shimla and Darjeeling is also called as queen of hill stations but the only thing it lacks is the toy train which is very synonymous to many Indian hill stations. However there is no comparison and Mussoorie has some beautiful bend hill roads connecting it from Dehradun. 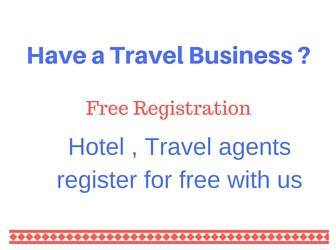 There are some direct buses from Delhi and other near by towns but the best place to reach Mussorie is through Dehradun . Deharadun is located at a distance of 30 Km south of Mussoorie. There is a bus / taxi stand known as Mussoorie stand near Dehradun railway station where buses and shared taxis are available. While coming to Dehradun you can get down near to this Mussoorie stand without going the main ISBT stand at Dehradun. From railway station you can walk down to this Mussoorie stand. A full taxi ( Maruti Van or Ambassador ) can cost you Rs 1700 to 2000 for one way dropping at Mussoorie and shared seat can be taken by paying Rs 100. Buses takes around Rs 60 to Mussoorie. Dehradun is well connect by air (Jolly Grant airport ), road and Indian railway network. If time is a constrain then you can plan a one day trip to Mussoorie with night stay at Dehradun or Haridwar or can take a three four days visit to this hill station. Like other hill stations Mussoorie has a Mall road with a valley view in one side. 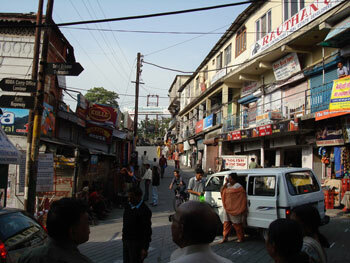 However the valley side is getting full with shops and restaurants living narrow paths to have a view of the valley. One end of the Mall road will take you to Gandhi chowk a center point and the taxi stand for Kempty water fall. The other end of Mall road is Kulri Bazar. Near Gandhi chowk and Mall road area you can download your pictures from your camera to burn a DVD or CD. This waterfall attracts many tourists particularly from plain areas. Located at a distance of 15 KM from Mussoorie town can be visitd by conducted tour or by taking a taxi near Gandhi chowk taxi stand. The cost for a full taxi taking you to the water fall with waiting time and return fair is Rs 510. Shared taxis are also available depending on the availability of co- passengers. At the water fall there are many shops and venders selling eatables. The parking area here is very small to accommodate heavy traffic during the summer holidays of May end and June particularly in afternoons. Visitors may have to leave their vehicles long before and walk up to the water fall. There is a small amusement park at the bottom of water fall. If you don't want to climb up or down then there is a rope way or cable car to take you to the foot of the water fall. The price in both direction is Rs 80/- per person. There are steps to take you up also to the edge of the water fall. You can take bath at this water fall and change your dress here. You can stand just below the fall while taking bath here. Bathing dresses are also available if you don't have your own, change rooms are also there. To enter the amusement park there is an entry fee and for boating and other games there are charges to be paid. Take a cup of tea by standing by the side of the water. Dress up like a Kashmiri girl or like a Pathan boy and take some photos here. This place is located at a short distance from Mall road and one of the main attractions is cable car to reach the top of the Gun Hill. Cable cars charge is Rs 56 for both ways. At the top of this Gun hill view of the Doon valley, Mussoorie town, Himalayan hills can be visible. On a clear day without any mist with the help of telescope Gangotri can be seen. The views are excellent and you can dress up with different color costumes and take photo with this beautiful background. Have a cup of tea while enjoying the views from this hill top. After returning from Gun hill you can walk or take a rickshaw to travel through this camel back road. The name is given as the road elevation resembles a camel back. This is also know as Mussoorie Jheel ( local name fro small lake ). On the way to Mussoorie from Dehradun this lake is Located at 6 KM before Mussoorie town. Here the Youth Hostel Association managed hostel is there. This hostel is the reporting camp for the YHA organized Himalayan trekking programs.